Your ultimate guide on how to extract subtitles from DVD using DVD subtitle extractor. "I want to extract subtitles only from my DVD for foreign language learning. However, I didn't find the feature of ripping subtitles from a DVD in DVD rippers out there, including Handbrake. Is it possible to get what I want? What should I do?" It's common to extract video or audio from DVD, but rare to extract subtitles from DVD. However, this doesn't mean that we don't need it. When we can't download subtitles online, ripping DVD subtitles is a way to go. When the subtitles downloaded online can't sync with the video ripped from a DVD correctly, we need to get subtitles off DVD. However, it isn't an easy task. Almost all DVD rippers lack the option of subtitles ripping. So, we need to pick out a special DVD subtitle extractor and then perform further operations, but both seem difficult for the ordinary. Thankfully, the best free DVD subtitle ripper along with the step-by-step guide have been prepared for you in this post. WinX DVD Ripper Platinum - rip DVD to VIDEO_TS folder with ease. Support backing up DVDs and those encrypted by CSS, region code, Sony ARccOS, UOPs, APS, RCE, Disney X-project DRM, etc. onto hard drive with all DVD information, including video, audio and subtitle tracks. How to Extract Subtitles from a DVD? Basically there're two steps: rip DVD to VIDEO_TS folder and extract subtitles from DVD folder. How to rip DVD to VIDEO_TS folder? 1. Download and install the DVD to DVD folder converter on your computer. Once complete, launch it. 2. Insert target DVD into DVD-ROM, hit "DVD Disc" button of the ripper to load the DVD. 3. 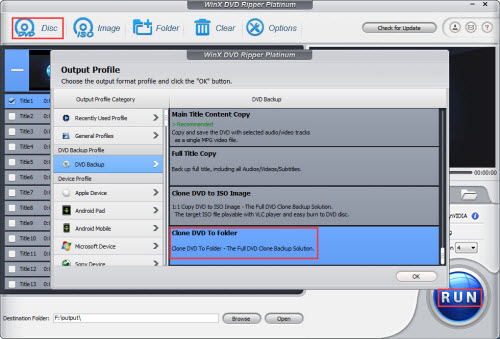 Locate "DVD Backup" from "Output Profile" dialogue, choose "Clone DVD To Folder" and hit "OK". 4. Click "RUN" to begin copying DVD to VIDEO_TS folder. This could be finished in a matter of minutes. Certainly, it also depends on your CPU and DVD driver speed. To begin with, you need to download a DVD subtitle extractor. After searching online, we dig out some for you, including SubRip, Jubler, D-subtitler, CCExtractor, SubtitleEdit, Avidemux, DVD SubEdit, VobSub and more. Here let's choose SubRip which can extract text-based SRT subtitle files, BMP, SUP files and SubPictures from DVD. Now let's see how to extract subtitles from DVD with SubRip. 1. Download SubRip on your computer. This DVD subtitle ripper is very lightweight. Then, install and launch it. 2. Click "VOB" button in the toolbar of first screen, and then you will open a new window. 3. Click "Open IFO" and load the first IFO file of the DVD folder you just ripped from DVD. Generally, it is VTS_01_0.IFO. Then, matching VOBs will be selected automatically. Now, navigate to "Language stream" and choose the one you want to rip. 4. In the right section of this panel, just leave Characters matrix file as New File, tick "SubPictures to Text via OCR" under "Action" option if you want to extract a text-based subtitles from DVD. 5. Next, click "Start" at the bottom to begin DVD subtitle ripping process. This is not the time to sit there and wait for output. 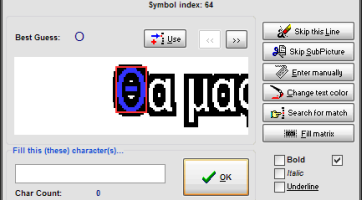 Because SubRip uses OCR to convert images-based subtitles to text-based, you need to manually input each character the first time this DVD subtitle extractor finds it. It usually takes you 5-10 minutes. The right figure is an example dialog. You're asked to check the blue character in the image, enter it below and click OK. Please note that they are case-sensitive. 6. After manual input, SubRip begins converting. It may cost about an hour to extract a 2-hour movie's subtitles. Don't walk away, because you may need to input manually when this DVD subtitle extractor finds unrecognizable characters. 7. Click the Save icon as shown in the right image to save your subtitles as SRT file when finished. Subtitles in DVDs are stored in VOB files, together with the main video and audio streams. DVD subtitle is just a stream of image files which appears one after another. Different from text -based subtitles, subtitles in DVD can't be edited, scaled or modified. • Rip DVD with a built-in subtitle track, forced subtitle only, or an external subtitle. • Copy DVD to DVD folder, ISO file, MPEG2 file, and rip DVD to MP4, AVI, WMV, MOV, MP3, iPhone, iPad, Android etc, in a breeze. Learn how to rip DVD movies with desired subtitles to AVI, MP4, MPEG, MOV etc. on PC/Mac to help you better understand the movie. Want to rip DVD with only forced subtitle (subtitle when foreign languages are spoken or shown)? This article will show you the technique. Is it possible to rip a DVD with menus? How to copy a DVD while keeping all menus or chapters? Best answers are given here!